The Global Climate Action Summit (GCAS), taking place today and tomorrow in San Francisco, is gathering leaders from around the world representing businesses, states and regions, cities, and other ‘non-state actors, to take the fight against climate change to the next level. And that’s a wrap on the summit. There are a few more sessions this afternoon, but the main track of the summit has ended with participants issuing a call to action to heads of state — it’s now their turn to scale up commitments before 2020. 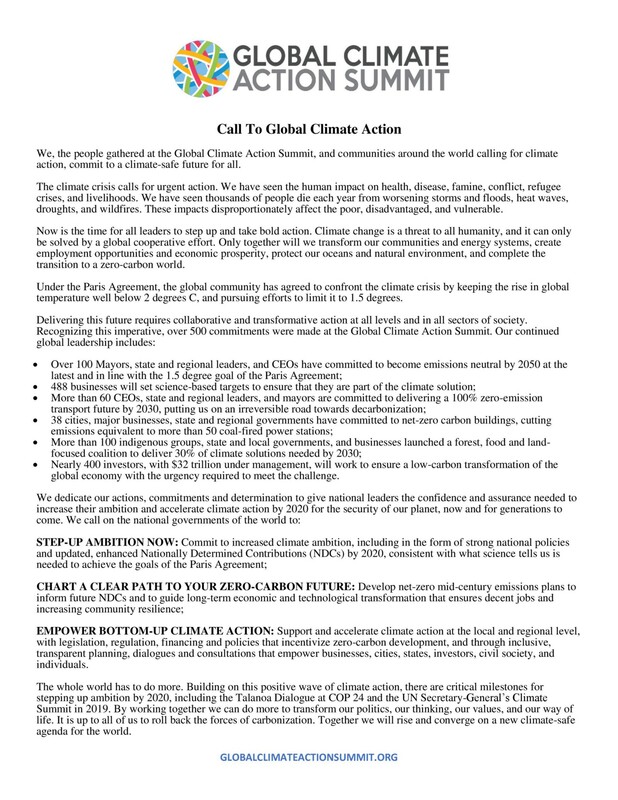 The call to action (scroll down to read) will be delivered to UN Secretary General Antonio Guterres in New York during Climate Week, the week after next. More than 500 announcements from thousands of subnational leaders, mobilizing billions of dollars in new commitments to fight climate change. These commitments raise the bar for national governments to step up their own commitments going into the next round of United Nations Paris Agreement negotiations. The summit also showed how American leaders are finding ways to move climate action forward despite the best efforts of the current Administration. The U.S. Climate Alliance, a coalition of 17 bipartisan governors, unveiled a suite of policy initiatives, including directing $1.4 billion from the Volkswagen settlement to drive down auto emissions, as well as plans to reduce short-lived climate pollutants, and enhance the carbon drawdown capability of natural and working lands. The We Are Still In coalition announced more than 300 new climate commitments, including businesses establishing science-based targets and reducing emissions in supply chains and factories. A comprehensive list of all the commitments made during the summit will be available after the plenary concludes. 29 global philanthropy organizations have pledged $4 billion over the next five years to combat climate change. They are describing this as the largest-ever private investment focused on climate action. — Nat Simons, co-founder of the Sea Change Foundation. 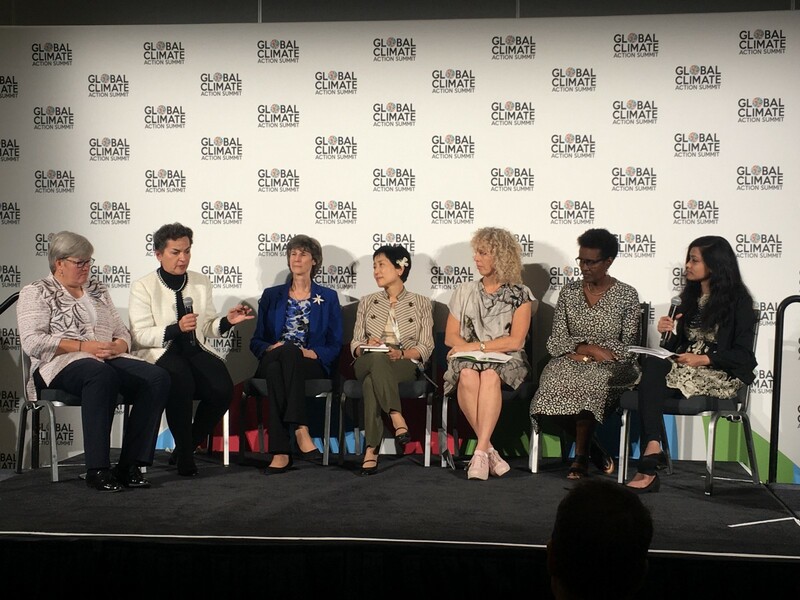 An all-woman panel of leaders convened on the sidelines of GCAS to promote a zero-carbon online summit of world leaders that will take place in November, the brainchild of Dr. Hilda C. Heine, President of the Republic of the Marshall Islands and chair of the Climate Vulnerable Forum. Governments will be invited to virtually attend and offer new climate commitments, paving the way for increasing global ambition to meet climate targets. The Summit Champions will ensure heads of government joining the Summit commit to new climate action and ambition. Here’s an interesting one. Eight big U.S.’s law firms have announced an initiative to deliver free legal services to advance climate action across the globe. Lawyers for a Sustainable Economy will offer pro bono legal assistance to entrepreneurs and community-based non-profits working on sustainability. French energy utility giant EDF has taken to the stage to revisit an earlier commitment to invest $8bn in boosting battery storage. (Covered by the FT here, back in March.) This will add 10GW of storage capacity, the company says. Electricity storage will be crucial for the energy transition. Variable renewable energy technologies rely on good storage options to ensure the energy they create can always meets demand. Storage technology is going through its own technological revolution, with rapidly falling costs, and air quality legislation and climate policies are likely to continue driving its expansion. According to Bloomberg New Energy Finance, the world added a record 1.6GW of energy storage in 2017 — a huge increase from 289MW in 2013. This year is expected to easily set a new record, with 1.4GW added in the first half of the year alone. Many of the announcements at the summit have been focused on mitigating climate change by cutting emissions, but there have also been a range of initiatives covering adaptation and resilience. Advocacy group the Natural Resources Defense Council has been working with heat-prone states in India to help them adopt heat action plans — covering things like public awareness campaigns, better identification of vulnerable populations, and expanded use of “cool roof” reflective paint, which can reflect sunlight and help houses absorb less heat. NRDC is also doing interesting things with states and cities in India on things to cut energy use and highlighting a range of initiatives that are being rolled out at a local level in the country — on things like electric transport, building more solar parks and waste management. Yesterday the C40 — a climate leadership group working to involve cities in climate commitments -announced the Deadline 2020 initiative–73 cities, representing over 425 million citizens, committing to develop inclusive climate action plans to strengthen resilience and become carbon neutral by 2050. C40 is calling it a “roadmap for cities committed to reaching the highest aspirations of the Paris Agreement”. Taken together, these cities represent 2.5% of global annual emissions — and these new commitments will save 12 gigatonnes CO2e of emissions by 2050. C40 plans to sign up more cities. 27 global cities have already peaked their emissions in advance of the necessary deadline of peaking emissions globally by 2020. A further 9100 cities representing 800 million citizens are committed to developing city-wide climate action plans addressing mitigation and adaptation. If fully realized, these commitments would account for reductions of more than 60 gigatonnes of CO2e between now and 2050. 6000 of these cities are already implementing plans that meet or exceed their countries’ Nationally Determined Contribution. At the summit, 12 cities — Birmingham, Greater Manchester, Honolulu, Medellin, Oslo, Oxford, Rotterdam, Santa Monica, Seoul, Tokyo, Warsaw, & West Hollywood — representing more than 140 million urban citizens have committed to deliver a zero emission mobility future. They join Paris, London, Los Angeles, Copenhagen, Barcelona, Quito, Vancouver, Cape Town, Seattle, Mexico City, Auckland, Milan, Rome & Heidelberg — all of who were already signed up. 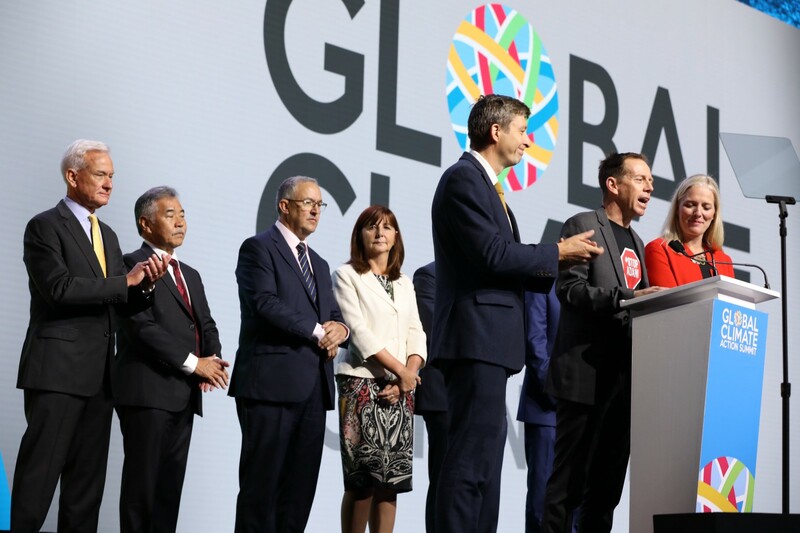 Welcome back to the GCAS liveblog, where we are highlighting some of the most significant announcements coming out of a sometimes overwhelming torrent of climate action at the Californian summit. We start today with a pretty big announcement on charging infrastructure for electric vehicles. EV charging companies ChargePoint & EVBox are leading a commitment to provide 3.5 million new charging points for electric vehicles by 2025. This is a big number. In 2017 there were about 350,000 public charging points across the US, EU and China — 102,500 in the EU, 47,117 in the US, and 213,903 in China — so even taken alone, this announcement would represent about a ten-fold increase on that. Many governments and states are committing to fund EV charging infrastructure. The Chinese government plans to build 4.8 million charging points by 2022, which will require approximately $1.9 billion of investment in infrastructure. In July 2018, the UK government announced a £400 million Charging Infrastructure Investment Fund to support companies that install charging points. The New York Power Authority committed up to $250 million to build electric vehicle infrastructure in New York state in May 2018, and in June 2018, the California Public Utility Commission approved $738 million worth of EV charging projects for several Californian utilities. Chargepoint says it is assuming that by 2025 there will be 20 million electric vehicles on the road in the markets it supplies, including the US and Europe. Worldwide, the numbers are likely to be even higher — annual electric car sales will reach 11 million in 2025, and 30 million by 2030, BNEF projects, with China responsible for much of this growth. In 2017 the number of EVs worldwide had just surpassed 3 million. Last night, California Governor Jerry Brown signed a range of bills boosting aiming to cut emissions from the state’s transport sector from the deck of a hybrid electric ferry — the Enhydra, which plies the waters of the San Francisco Bay. They included measures to boost EV takeup, encourage low-emission ridesharing for agricultural workers in the state, and assess California’s EV infrastructure needs. That’s it for the day’s sessions. Day one of the Global Climate Action Summit racked up more than 70 announcements showcasing actions that companies, cities and states will take to reduce emissions and step up their climate ambition. And there’s more to come tomorrow. The Powering Past Coal Alliance added ten new members committed to phasing out coal power entirely, including Wales, U.S. states Minnesota, Connecticut, New York, and Hawaii, and the Australian Capital Territory. A group of 17 U.S. states and territories will direct $1.4 billion to low-carbon transportation and adopt a range of initiatives to sequester carbon on public lands, reduce super pollutants, deploy more solar energy on modernized energy grids, and develop shared product efficiency standards. The states will also work in partnership with Mexico and Canada to advance climate action across North America. 73 cities are developing plans to strengthen resilience and become carbon neutral by 2050, in alignment with the Paris Agreement’s 1.5 degree goal. 27 cities globally have already peaked their emissions. 26 cities, states, regions, and businesses representing more than 122 million people announced zero-emissions vehicle targets, signaling to the industry that the auto sector is going electric. The $20.7 bn Mahindra Group committed to become carbon neutral by 2040. NRDC announced its Clean Jobs Count campaign has over 20,000 people pledging to ask lawmakers to do more on climate and clean energy policy. Some new investment in EV charging infrastructure will be announced around 11:25 am, followed by further announcements of major investment in battery storage. Several religious endowments will announce a joint effort to protect large swaths of the Amazon rainforest, expected around noon. Tackling waste is a huge part of meeting climate targets and there have been a couple of interesting initiatives announced today. Cutting waste could save 4–6 gigatonnes of CO2e —some 15–20 percent of global mitigation potential. About a quarter of all food produced for humans is not consumed, costing about $1 trillion in annual economic losses globally, and If food waste were a country it would be the third largest emitter of greenhouse gases. The Pacific Coast Collaborative (California, Oregon, Washington, British Columbia, Los Angeles, San Francisco, Oakland, Portland, Seattle, and Vancouver, BC) today committed to cut food waste and loss 50% by 2030 and quantify the difference in emissions reductions. Also today, 25 cities, state and regional governments have pledged to reduce the amount of waste they produce, cutting municipal solid waste generation by at least 15% per person by 2030, (on 2005 levels), cutting the amount of municipal solid waste that goes to landfill and incineration by at least 50%, and diverting more waste away from landfill and incineration. This will mean 132 million tonnes less waste in landfill and incineration by 2030, and 150 million citizens living in areas that have commited to move towards zero waste. Some of the cities and regions participating include Auckland, Catalonia, Copenhagen, Dubai, London, Milan, Montreal, New York City, Paris, Philadelphia, Rotterdam, San Francisco, San Jose, Santa Monica, Sydney, Tel Aviv, Tokyo, Toronto, Vancouver & Washington D.C.
Thirty-seven cities, businesses, states and regions have committed to significantly cut greenhouse gas emissions from new and existing buildings by 2030 under the Zero Carbon Buildings Commitment. (Press release here.) The energy used to heat, cool and power buildings is responsible for nearly a quarter of global emissions, and eliminating buildings emissions in just the 19 city signatories is equivalent to shutting 47 coal-fired power stations. 718 cities globally already have commitments to increasing the efficiency of new and existing buildings and this new initiative will add to that momentum. The ZEV Challenge will see governors and premiers from 12 global states and regions representing over 80 million people and over 5% of global GDP have committed to 100% zero emission vehicle fleets by 2030 — and to pushing policies that will accelerate a transition to zero emissions vehicles. This builds on an earlier commitment to ensure all vehicles sales are zero emission by 2050 or earlier. That was projected to unlock GHG reductions of over 125 million tons CO2 per year in 2030, and over 1.5 billion tons CO2 per year in 2050. IKEA has announced that all of its delivery services will be 100% zero emission by 2025, and by 2020 in five major cities — Los Angeles, New York City, Shanghai, Paris and Amsterdam. Twenty-six international states, regions, cities and businesses including California, Washington State, Tokyo and Seoul have simultaneously committed to 100% zero emission vehicle targets through the EV100 initiative. Taken together, these entities represent a population of over 122 million. Transport is responsible for almost a quarter of carbon dioxide emissions worldwide. Three-quarters of these emissions come from road vehicles. The growth of the electric vehicle market has outpaced projections in recent years. In 2010 there were a few thousand electric cars on the road worldwide. In 2017 the number surpassed three million and rose to four million six months later. The Investor Agenda has been formally launched — it’s an initiative that brings together nearly 400 investors managing US $32 trillion in assets. They are promising to speed up and scale up the actions that are critical to tackling climate change and achieving the goals of the Paris Agreement. Members will report on their actions across four areas: Investment, Corporate Engagement, Investor Disclosure and Policy Advocacy. The RE100 initiative to set 100% renewable energy targets now has almost 400 different signatories, including global companies, health care providers, cities, states and regions. Four new members join RE100 at GCAS: Sony, McKinsey, RBS and WeWork. As well as businesses, RE100 involves 230 states, regions, cities and counties around the world. The initiative launched in 2014 with 12 original corporate partners. - Kahori Miyake, executive officer of Aeon, the largest retailer in Asia. - Helen Clarkson, CEO of the Climate Group. - Shane Rattenbury, Minister for Climate Change and Sustainability, Australian Capital Territory. 73 cities, representing over 425 million citizens, have committed to develop inclusive climate action plans to strengthen resilience and become carbon neutral by 2050, in alignment with the 1.5 degree goal of the Paris Agreement, under an initiative called Deadline 2020. 27 global cities have already peaked their emissions. Bank of the West, a subsidiary of BNP Paribas, has announced $1 billion in new commitments to renewable and clean energy. This includes a commitment to reduce its carbon footprint by 25 percent and operate at carbon neutrality by 2020. $500 million in financing for renewable and clean energy, $200 million in investments and loans for energy efficient city infrastructure and housing and $300 million in loans to help people access EVs and low emissions vehicles. The governors of California, Connecticut, Hawaii, and Washington are holding a press conference now to announce new joint commitments and progress on climate policies, ranging from $1.4 billion in electric vehicle funding to closer climate collaboration with Canada and Mexico. The four governors are part of the United States Climate Alliance (USCA), a bipartisan coalition of 17 governors committed to reducing greenhouse gas emissions in line with the Paris Agreement targets. Taking steps to protect protect and sequester carbon in state lands. Cutting emissions of short-lived climate pollutants, including methane, hydrofluorocarbons (HFCs) and black carbon. Virginia will aim to cut methane pollution from natural gas infrastructure and landfills, and Connecticut, Maryland and New York will all look into regulations next year to halt the use of HFCs, similar to measures recently adopted in California. More measures to push the transportation sector towards deep emissions reductions. Steps to reduce the effect of federal solar import tariffs which could slow solar deployment in the US. Developing a common set of product efficiency standards that can cut energy use. With Canada and Mexico, pursue a goal of 50% of zero-carbon power generation by 2025 across North America. More info here via the Atlantic. In a new announcement made at the GCAS summit, the $20.7 bn Mahindra & Mahindra group has announced a commitment to become a carbon neutral company by 2040. Mahindra includes one of the largest car manufacturers in India and employs over 2.4 million people across 100 countries. It will focus on energy efficiency, the use of renewable power and strengthening carbon sinks. to achieve this target. Science Based Targets is an initiative to help companies set their own targets for emissions cuts which are in line with the Paris Agreement. Today it announced that it has signed up 488 companies in 38 countries around the world — with a combined market capitalization of nearly USD$10 trillion, or about an eighth of total global market capitalisation. That’s the same size as the total NASDAQ stock exchange — and includes nearly a fifth of Fortune Global 500 companies. These companies produce 795 million metric tonnes of CO2 equivalent a year from their direct operations alone, or about the annual emissions of Germany. Over 130 companies have joined the initiative this year. The Port of Rotterdam is the largest port in Europe, and tenth largest in the world. Every year it processes nearly half a billion tonnes of freight, and industry based at the port is responsible for a somewhat staggering 20% of Dutch emissions. At the summit, the port has announced it is working towards becoming carbon neutral, in line with the objectives of the Paris Climate Agreement. The shipping industry is responsible for about 2.3% of global emissions — it it were a country, it would be the sixth largest source of carbon pollution. Also announced today, the World Ports Climate Action Program sees a range of big ports across the world commit to “take a strong role in climate and clean air action”. Antwerp, Barcelona, Hamburg, Los Angeles and Rotterdam are all signed up. Earlier this year, the International Marine Organization committed to “reduce GHG emissions from international shipping and phase them out, as soon as possible in this century”. The CEO of software company Salesforce has taken to the stage to announce the launch of the Step Up Declaration, a new alliance to harness the power of emerging technologies to cut greenhouse gas emissions across what they are calling the “fourth industrial revolution” — developments like AI, cloud computing and the Internet of Things, to cut greenhouse gas emissions. The alliance has some big names from across the tech and communications sectors, including Salesforce, BT, Hewlett Packard Enterprise, Uber, Lyft and Ericsson. Different partners are making a range of different commitments — Salesforce, for example, is committing to powering itself through 100% renewable energy by 2022, while BT will help its customers reduce their own carbon emissions. This adds to moves from some of the biggest US tech companies to shift towards clean energy — moves which are having a significant impact on the US power sector. Such moves save money as well as having climate benefits— in 2016 alone, some 80,000 emission-reducing projects by 190 Fortune 500 companies saved nearly $3.7 billion. Kaiser Permanente, one of the nation’s largest healthcare providers, has finalized an agreement for a major renewable energy purchase that will enable it to achieve a goal of being carbon neutral in 2020. The power purchase agreement for 180 MW of clean energy will power 27 of the health company’s 39 hospitals and pay for the construction of utility-scale solar and wind farms, as well as one of the country’s largest battery energy storage systems. The Powering Past Coal Alliance was launched at President Macron’s One Planet Summit in 2017 as a collection of 21 countries, states, businesses and cities committed to a rapid phase-out of traditional coal power plants. Members commit to phasing out coal power generation entirely and cooperating to achieve that goal. The Alliance had a goal of expanding to at least 50 members by the end of 2018. As of today, it has 74 members, including 29 nation states, 17 sub-national and 28 businesses. The membership of US states, cities and businesses is significant because it demonstrates opposition to the Trump Administration’s rhetorical support for coal. Since 2010, 1,705 proposed coal plants have been cancelled, according to the Global Coal Plant Tracker. Alliance partners include the United Kingdom, which in 2015 was the first country to commit to phase out coal entirely. The share of coal in the UK electricity mix has fallen rapidly in recent years, meeting less than 7% of demand in 2017. 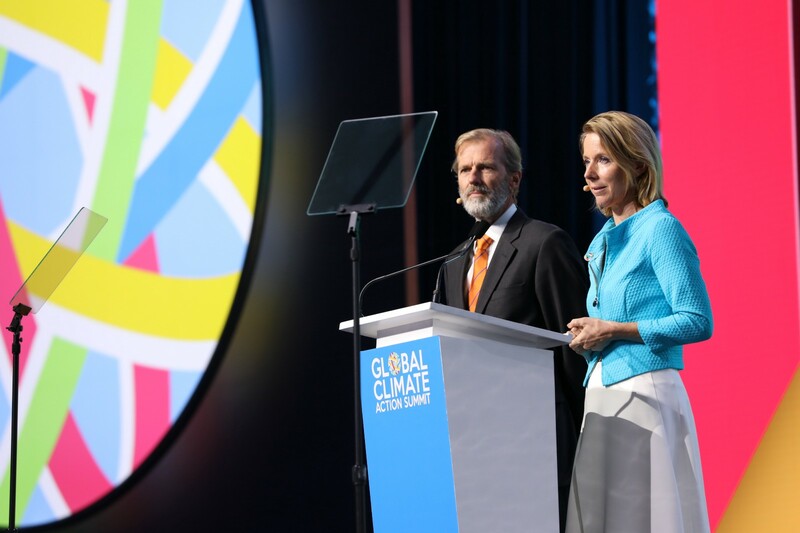 Members of the Powering Past Coal Alliance address the GCAS Plenary. News also this morning that the New York City Pension Funds will double investment into climate-change solutions over the next three years, investing $4bn over that period. On Monday, New York City Mayor Bill de Blasio called on all cities to divest from fossil fuels in an op-ed with London Mayor Sadiq Khan. Yesterday, an event at the GCAS ‘China Pavilion’ saw delegates from China and California signing a series of agreements to enhance cooperation on efforts to cut emissions, set up carbon trading schemes and share clean energy technologies. The Governor of New Jersey, Phil Murphy, has announced the state is on course to reach a goal of 3,500 MW of offshore wind energy capacity by 2030. This is significant because almost all of the US’s wind power is onshore wind — so far the US has only a tiny 29 MW of offshore wind capacity, compared with 16,385 MW in the EU and 2,641 MW in China. The cost of offshore wind power has fallen fast — in the UK, for example, it is now cheaper than natural gas. Mayor of Paris Anne Hidalgo has introduced new analysis showing 27 cities around the world have already peaked their carbon emissions, even as their populations and economies have grown. The cities now have emissions at least 10% lower than their peak. The cities are: Barcelona, Basel, Berlin, Boston, Chicago, Copenhagen, Heidelberg, London, Los Angeles, Madrid, Melbourne, Milan, Montréal, New Orleans, New York City, Oslo, Paris, Philadelphia, Portland, Rome, San Francisco, Stockholm, Sydney, Toronto, Vancouver, Warsaw and Washington D.C. Taken together they account for 54 million urban citizens and $6 trillion of GDP. Johan Rockström of the Stockholm Resilience center and former UN climate chief Christiana Figueres have introduced The Exponential Roadmap, a new report which identifies 30 solutions that could halve greenhouse gas emissions by 2030. The report says that wind and solar power are now growing so quickly — and exponentially — that if it replaces fossil-fuels, clean energy will be able to provide over 50% of global electricity supply by about 2030. Renewables grew on average of 16% per year over the decade to 2015. 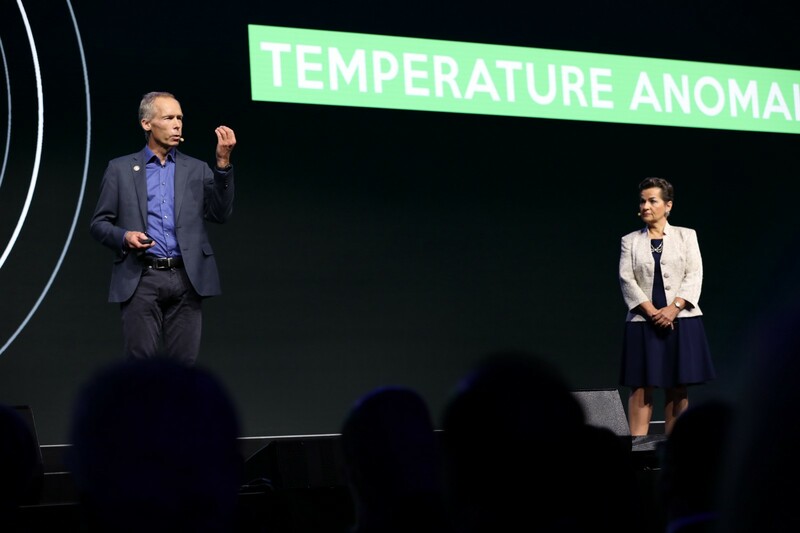 Johan Rockström and Christiana Figueres present the Exponential Roadmap. Action across a range of other sectors will help deliver emissions cuts that can rapidly scale — but the world will need to cut emissions in half every decade to meet climate targets, Rockström says. That is going to depend on accelerated climate leadership — exactly what GCAS is about — and for the ongoing digital revolution in artificial intelligence and cloud computing to be aligned with emissions cuts. “Right now, it is easier to imagine a global climate catastrophe than a rapid economic transformation, yet the next decade could see the fastest energy transition in history. People underestimate the power of exponential growth. If renewables keep doubling every five or six years, as they have for a decade or more, they will push out fossil fuels much faster than most forecasts. But not without stronger policies.” — Owen Gaffney, report author. We’ll be keeping track of the announcements coming out of the summit today and tomorrow. Taken as a whole, GCAS is going to showcase a huge amount of change underway in the US and globally. There’s a lot happening, so this will be a curated selection of the initiatives, pledges and statements unveiled over the next couple of days. World leaders have also weighed in this morning, with Emmanuel Macron stating that the world “must act together to foster innovation, boost transformative projects, gather public and private investments, and deliver on our promises for the next generations.” “Meanwhile, outside the summit, protestors have gathered to call on Governor Brown to go even further and end oil extraction in California — and to protest carbon trading and “false solutions” to climate change. Preview — Leaders will announce new commitments and partnerships that will significantly reduce carbon pollution. Recent research shows these kinds of commitments will play a critical role in meeting the goals of the 2015 Paris Agreement. California Governor Jerry Brown, who is one of the co-convenors of the summit, got a head start on Monday, signing a bill requiring the state get all of its electricity from clean energy sources by 2045, and an executive order establishing a goal to make the state’s economy — the world’s fifth-largest — carbon neutral by the same date. The summit marks the beginning of a critical political season for climate action, with the publication of major report from climate scientists at the Intergovernmental Panel on Climate Change (IPCC) in October, and UN climate talks in Katowice, Poland in December that will see countries signaling they will increase climate ambition by 2020. GCAS also arrives as communities on East Coast of the U.S. are bracing for a major hurricane, fueled by sea surface temperatures 3.6°F (2°C) hotter than normal. 2018 has already seen a string of heatwaves, wildfires and record-breaking temperatures. In a speech on Monday, UN Secretary-General Antonio Guterres called on world leaders to take faster, more ambitious steps to fight climate change. GCAS will likely provide a torrent of initiatives underway around the world to address climate change. 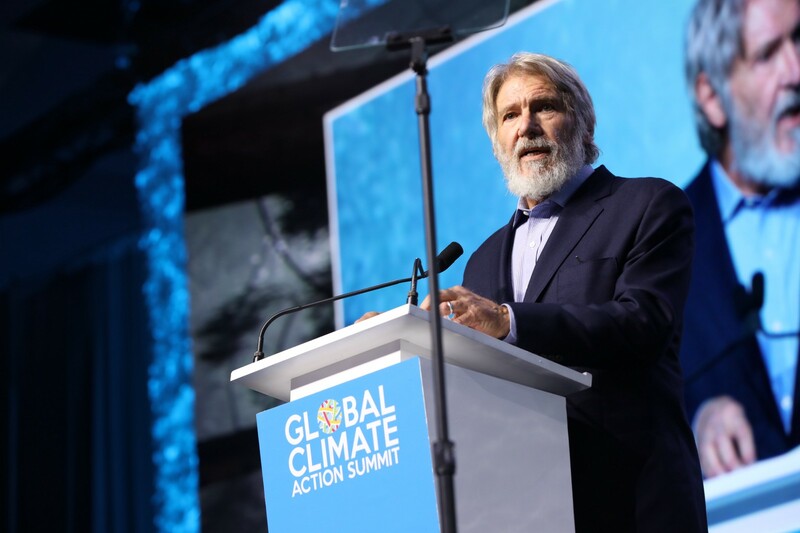 We’ll use this blog to highlight news and announcements from the Global Climate Action Summit during September 13th–14th. America’s Pledge, an initiative to measure the progress that cities, states, businesses, and other subnational actors are making to reduce emissions towards the U.S. Paris Agreement goal, launched a new report Fulfilling America’s Pledge. It suggests that by following a set of high-impact, near-term, and readily available strategies, cities, states, businesses, and other actors could drive US emissions down to 21 percent below 2005 levels by 2025 — a significant step towards the original U.S. target under the Paris Agreement of 26–28 percent below 2005 levels by 2025, even without further federal action. C40, a coalition of cities representing 650 million urban dwellers around the world, released a new report this week showing that by pursuing urban climate change policies like energy efficiency retrofitting, enhanced bus networks, and district-scale renewable energy, cities could create 5.4 million urban jobs and prevent the premature deaths of nearly 1 million people a year from air pollution and traffic accidents. Cities produce about 73 percent of global carbon emissions. The Green Bonds Pledge, an initiative to drive the use of ‘green bonds’ to finance low-carbon infrastructure, announced its founding members, including the U.S. State Treasurers of California, New Mexico and Rhode Island, the Cities of Asheville and San Francisco and Australian pension fund Local Government Super.